Cloudfone breaks its silence by unveiling its first ever quad-core device, the Thrill 450Q. This Thrill will be gunning the likes of CM Flame 2.0, but it could easily throw the latter out of the equation with its stunning 12MP BSI rear camera (Flame 2.0 has 5MP). It's 4.5-inch IPS screen is treated with One Glass Solution technology that could push the pixel density up to 245 ppi. A gigabyte of RAM will solve major UI issues together with the 1.2GHz quad-core CPU. Other notable specifications include the 4GB of internal memory which is, of course, expandable through a microSD slot, 3MP front camera and 1800 mAh battery rating. 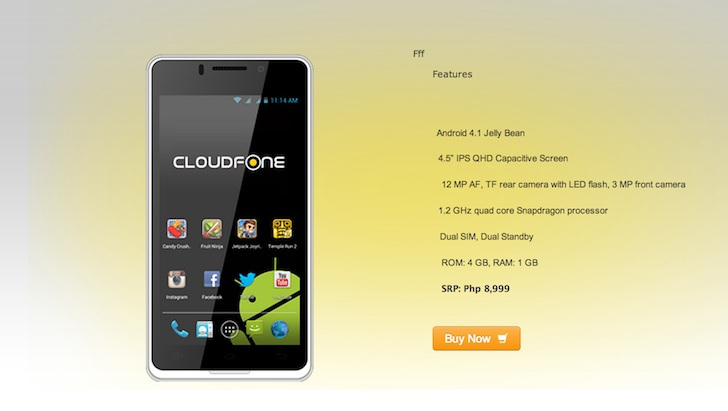 The Cloudfone Thrill 450q is priced at Php 8,999 which is two grand higher than the Flame 2.0.